1.Adopted inoculated casting for highly rigid machine frame; Internal stress eliminated by aging treatment; Box shape frame structure with internatal symmetrical reinforced ribs for high rigidity, heat resistance and shock resistance. Mechanical structure optimized by FEA method for high strength machine body. 2.Ground and hardened sliding guiderail for 3 axes, obtains heavy loading capacity and high precision, especially suitable for heavy duty cutting. 3.Precision ballscrews of 3 axis are preloaded for better positioning precision in long time working. Direct drive motion of 3 axes have better precision and less vibration. 4.Spindle motor 7.5/11kw with 8000rpm speed, meeting different machining requirement. Optional 10000rpm, 12000rpm spindle is available. 5.Tool arm type automatic tool changer with 24 tools is available, which is controlled by PLC, realize fast and stable tool change. 6.Centralized lubrication system is applied to realize automatic, independent, time fixed, volume fixed lubrication to each part. 7.Fully enclosed metal cover is equipped for better protection of operator and cleaner working environment. 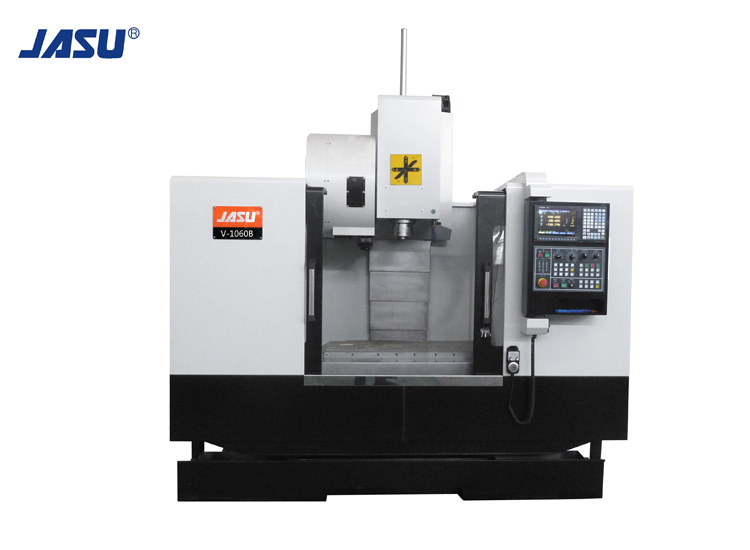 8.Automatic coolant system is for workpiece cooling and washing down cutting chip.